Born and bred in Wales, a native of Swansea, and twice a Welsh triallist, Dai Gent became a Gloucester, Gloucestershire and England player. He was a scrum-half as big in heart and as gifted in skill as he was small in stature. He made 146 appearances for Gloucester between 1903-11, and was captain for the 1906-7 season. He won 5 caps for England, his first being against the 1905 New Zealand team. He later became a school headmaster, and rugby correspondent of the Sunday Times. David Robert Gent was born in Llandovery, Wales, in 1883. By 1901, Dai had decided on a career as a teacher, and at age 18 was a pupil teacher in Swansea. In order to advance his career, he left Wales to train as a teacher at Cheltenham Training College, and it was there that George Romans, then captain of Gloucester, found him. In the 1904-05 season, Dai played in 27 of the Club’s 36 fixtures, now under the captaincy of Billy Johns, and the Club continued to pay exceptional expenses to get him to Gloucester games. From the start of the season, the Club had difficulty in finding a partner for Dai at half-back. Eventually Jimmy Stephens was moved from centre to solve the problem, and this partnership worked very well. As WB wrote at the end of the season: “Except on rare occasions, Stephens and Gent proved a great success in combination. Gent has been a wonderful acquisition to the team, and the proud position Gloucester occupies this season is in no small measure due to his skill and cleverness. As a scrum worker he has no superior in England, and some good judges are of opinion that given equal chances he is little inferior to Owen, admittedly the smartest half-back in the four countries. Though perhaps the smallest player taking part in first-class Rugby football, Gent has a big heart, and the desperate rushes of opposing forwards have no terrors for him. Sharp as a needle, possessing keen judgement and infinite resource, and a safe pair of hands, he has all the attributes that go to make up a successful scrum-half, and there is little doubt that International honours will fall to his lot in the near future. Gent was reserve to Owen in all three matches for Wales this season and besides played for Gloucestershire and Glamorgan.” He also won the CountyCup with Gloucester, who defeated Bristol 18-0 in the final, the players being presented with individual gold medals as well as the cup itself. In 1905-06, Dai kicked off the new season with a try in the first game against Clifton; this match following the opening of the new gymnasium (now known as the Lions’ Den). The gymnasium was much admired by the All Blacks who arrived at Kingsholm to play the Club a month later. Gloucester thought it a good idea to play an extra half-back and to do without a wing forward – Dai was one of those half-backs, and reported that “we were too light – that was the chief reason they beat us by a cricket score – they simply trod on us and went on!” – to the tune of 44-0. It was reported that Dai had Gallaher, the New Zealand wing forward, all over him throughout the match, but that Dai still managed to get the ball away neatly much of the time. Dai played in all four of Gloucestershire’s matches in 1905-06, against Glamorgan, Devon, Somerset and Cornwall, but the County failed to progress beyond the South West Group. However, this exposure to representative rugby helped to bring his skills to the attention of the national selectors, and they stepped in to offer Dai the opportunity which he had been denied in Wales, the land of his birth. Dai won his first cap for England against New Zealand on 13th January 1906 – his teammate from Gloucester, Arthur Hudson also played in the match and scored a try which provided England’s only points in a 3-16 defeat. Dai won further caps that season against Ireland and Wales. Dai must have enjoyed the thought of having an All Black as his replacement – coincident with one of these internationals, Gloucester had a fixture against Leicester, and, in the absence of Gent and Hudson playing for England, the Club drafted in three of the touring All Blacks (McGregor, Mynott and Seeling) who happened to be visiting Gloucester at the time, and they assisted in a 20-0 victory. Dai picked up 2 further County caps against Devon and Somerset, and was also selected for an England trial game, West v London, in December 1907, but gained no international honours this season. Dai picked up another 7 County caps, playing in all of the County Championship matches. On 1st October 1908, he was in the Gloucestershire side which took on the touring Australians at Kingsholm. Although the performance of “the Colonials” was considered disappointing, they still ran out 16-0 winners. Dai made 19 appearances in 1909-10, and scored against Cheltenham and Pontypool, and his performances still entranced the Kingsholm faithful, as WB reported at the end of the season: “Gent and Stephens, at half-back, continued their successful combination, to the delight of their admirers. The International all through played football of the highest class, and his selection for England was a well-deserved compliment to one of the cleverest and most popular players who ever donned a City jersey. Gent’s departure in March to Plymouth was a source of general regret, and his place will be hard to fill.” Gold medals were presented to the players at the AGM in June, to commemorate winning the CountyCup, but Dai’s had to be sent on to him, because he had already left Gloucester. Dai’s form for Club and County, for whom he won 7 further caps, brought him to the attention of the national selectors again. He captained Gloucestershire in the 3-way South West Group replay, in which Somerset were defeated 16-8 at Kingsholm, and then Cornwall were beaten 12-11 at Redruth. After squeezing past Kent 6-3 in the semi-final at Blackheath, seven Gloucester players, including Dai, were chosen for the final played at Kingsholm on 9th April 1910. They beat Yorkshire 23-0, with 2 tries from Arthur Hudson, and thus became CountyChampions. Dai was not selected for the first England trial, but was in the Rest side, alongside Gloucester teammate, Billy Johns, which beat the England side containing Arthur Hudson and Harry Berry 18-10 in the final trial at Twickenham. Dai was selected to play against the land of his birth in the first international played at the new Twickenham ground on 15th January 1910. Alongside Johns and Berry, Dai helped England to victory 11-6, their first win against Wales since 1898. Dai was described as “a Welsh type of half, a giver of good passes, and knows something about scrum working”. On the strength of this performance, Dai was selected to play in the next game against France in Paris, but he had to decline the invitation, and this proved to be the end of his International career. However, he had gone out on a high note, helping England to win the International Championship. This season was also effectively the end of Dai’s career with Gloucester. He made a single guest appearances in each of the next two seasons, 1910-11 and 1911-12. His final appearance was against Watsonians at Kingsholm on 23rd December 1911, and his final record was 146 appearances, 14 tries, 2 dropped gaols, for 50 points. Dai’s teaching career had taken him to Plymouth, where he was appointed headmaster of Saltash School; he later moved to become headmaster of a school in Eastbourne, Sussex, and remained in that area for the rest of his life. For many years he was the rugby correspondent of the Sunday Times, and he also wrote books on the game he loved. He died at Hailsham in 1964. 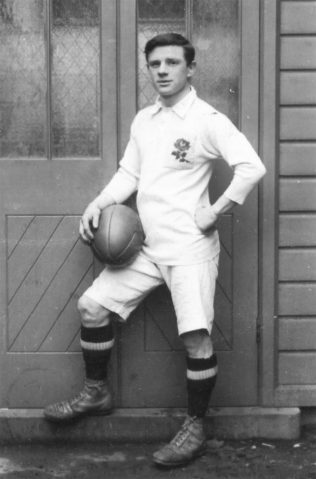 “D R Gent, who captained the Gloucester team in 1906-7, is one of the few players who appeared in international trials for two countries – Wales and England. He was eventually “capped” for England on 5 occasions. Gent , whose connection with the City club extended over six seasons (1903-4 to 1909-10) will be best remembered for his brilliant association at half-back with Jim Stephens. They were the ideal club pair, with a perfect understanding, and made Gloucester’s back play for several seasons a delight to watch. As is well known, Gent, a native of Swansea, was discovered by George Romans when a student at Cheltenham Training College, and the then Gloucester Captain, who was a keen judge of a player’s capabilities, had no hesitation in recommending the young Welshman to the notice of the City club. On finishing his course at College, Gent obtained a position on the teaching post at CaltonRoadSchool, and fortunately for Gloucester, was regularly available for the side. An immediate success on entering first class football, his advance was very rapid, and in 3 years he was chosen as England’s scrum half. Many sound judges held the opinion that Stephens should have joined his partner in the international field, but he had to be content with a reserve position. Before his selection for England, however, he had secured an international trial for Wales as deputy for the famous Dicky Owen (Swansea) and did remarkably well. But the latter was a permanent fixture for the Welsh team so long as he was fit, and the Gloucester player never got a chance to represent his native country. The Rugby Union selectors , however, recognised Gent’s claim to highest honours, and in 1906 he made his first appearance for England against Wales at Richmond, a match in which Arthur Hudson also gained his first cap. England suffered defeat in this game by 2 goals, 2 tries to 1 try (scored by Hudson). Though on the losing side, Gent must have given every satisfaction, for in the same season both appeared against Ireland; Gent was also selected for a third match against New Zealand (the first All Blacks). Gent’s other 2 international matches were Ireland and Wales in 1910. Gloucester’s record during Gent’s leadership of the team was not particularly distinguished for brilliant performances, due largely to the frequent changes found in the back division, and the fact that the skipper himself owing to various causes was unable to play in nearly half the fixtures. Gent enjoyed great popularity with the Kingsholm crowd and there was general regret when he left the city to take up the appointment of headmaster at Saltash Council School. He continued his football for a time with Plymouth Albion and also played for Cornwall, but later he secured another post at Eastbourne. A Little Tribute from D. R. Gent. ‘So it’s the old Club’s fiftieth birthday; well, many happy returns to it ! I sincerely hope that it will keep going for at least as long again, and that it will give its playing members in particular the great pleasure it gave me. I never tire of telling folk I meet in my football travels up and down the country of the extraordinary record of the Gloucester Club. That a small city of the size of Gloucester should have had a Rugby Club that has always been among the half-dozen leading sides in the country is an astonishing record. Look at the towns, two or three times as big – and more – that have tried to run a Rugby side, and have had to be content with poor teams, or, in many cases, have failed in the attempt. My delightfully happy days commenced at the end of the 1902-3 season, though as a humble spectator. I had seen the Club play many times before then – at Swansea, when Walter Taylor, George Clutterbuck, and Percy and Frank Stout were among the “stars”. In the close season of 1902-3, in April I should think, George Romans asked me to play for a scratch side he was taking, under the auspices of the Club, to play at Cinderford. I was then at St. Paul’s College, Cheltenham, and I was very excited at the honour, as was everybody in College for that matter. I forget whether we won or lost, but two things I do remember; first, that “Channer” Westbury played well, and that there were easier sides to play against than Cinderford, at Cinderford. And that opinion remains with me now! My first official match was against Bristol, at Bristol, in the Christmas holidays of 1903, and when I look back I can’t help thinking that the Fates fully intended me to start seriously, with no soft games in which “to get my hand in,” as it were. Cinderford at Cinderford, Bristol at Bristol, Blackheath at Kingsholm were my opening games. Oh! – that game at Bristol! It rained in a deluge, blew a hurricane, and was freezing cold. I was lent a pair of Gloucester stockings. They must have belonged to Hawker or some such heavy-weight, for I remember that after I had put my garters on, they hung over my boots! Then as they got saturated with mud, they tended to hang down well-nigh to my heels. I did feel uncomfortable, and looked it, I’m sure. At half-time, we implored the referee (F. W. Nicholls, of Leicester) to stop the match. “Play on, men!” was his stern reply, a phrase of his that was familiar to all players of that time, and “play on” we did. I believe we won by a try, but I suppose that I must have shown signs of pluck or skill or something, despite the weather and the stockings, for a few days later I had the first of a long succession of cards telling me that I was picked to play on Saturday. I was a proud man, I can tell you. The next match was at Kingsholm, and was against Blackheath. It was memorable to me because the Blackheath full-back was none other than H. T. Gamlin. I don’t mind confessing now that I fully resolved before the match that his tentacles wouldn’t embrace me! If I did get near him, there would be a punt ahead or a kick to touch! The match was also interesting in that the new Secretary of the Rugby Union, Wing-Commdr. S. F. Cooper, played on the wing and scored a good try, performing one of his famous jumps to get it. My career with the Club after that time is probably remembered by older followers of the game. It was one long pleasure to take part in the games, for they were delightful fellows who formed the side, though drawn from all classes. George Romans, Gordon Vears, Arthur Hudson, “Jimmy” Stephens, Lindsay Vears, George Matthews, Fred Pegler, Billy Johns, Jimmy Harrison, Ernie Hall, “Whacker” Smith, Bert Parham, and, later, A. E. Wood. These are just some of the names that come back to me. What times we used to have, playing good, clean football in all parts of the country, and having a rollicking time afterwards! I can’t help thinking that the Club was well served in those days, probably because it was well run (as I have no doubt it is now). F. W. Lovesy, Charlie Williams, Bobby Bingle, the late H. M. Taynton, the late C. H. Dancey, “Major” Worth, “Billy” Rasbach, Alf Kiddie, Jack Brookes, Arthur Grey, H. G. Brown – these among others saw to the administration, and were partly responsible for the pleasure it was for us to play. Then again, there was – and is, fortunately – Tommy Bagwell. The Club has been fortunate in its trainer. No young fellows could have been “fathered” by a more reliable, helpful, and thoroughly sensible man. I hadn’t the good fortune to see him play, but I know that as an old player his advice was always acceptable to me, and always given in a kindly manner. I only hope that the players attached to the Club to-day take advice as they should, and don’t get it into their heads that they know all there is to know, and that old men, at any rate, can’t teach them anything. There is a lot of that feeling in the world, I’m afraid. Some of us “old ‘uns” who are inclined at times to offer advice used to play the game ourselves, and at times, perhaps, played it well – they don’t seem to remember that. I remember with pleasure, too, Joe Cromwell, then assistant trainer, but now promoted to the higher sphere of Committee man. Poor old Harry Dyke is gone, I believe! It would be a funny old Kingsholm to me, without Harry floating about, and his famous horse not far away. They were inseparable, and were often to be seen holding earnest conversations with each other. In my early days we changed at the White Hart; then came our pavilion, opened with great ceremony, and we thought we were a provincial Twickenham, as it were. Now, there are all sorts of modifications in the arrangements for players and spectators, but nothing need ever be done to the playing pitch, as good a bit of turf as is in the country. I honestly loved to play on it, and what with practices and matches, I got to know every inch of it. I think I could have found touch at one time standing on my head! And what about George Romans? His accuracy at Kingsholm was a by-word in those days. Of course, the most memorable match in my day was that against the New Zealanders in 1905. We had a very fine side indeed at that time, but we were too light. In the all-important middle of the field were Stephens, Harrison, Hall, and myself, not one of us as much even as 11 stone in weight, whilst my own “fighting” weight was, to be exact, 9st. 4lbs.! That was the chief reason why they beat us by a cricket score – they simply trod on us and went on! Then there were our “battles royal” with Cheltenham and Bristol. Rarely was there much football played, because feeling ran so high. At times one wondered what we had a ball for, as it didn’t seem to matter whether a man had the ball or not. Mind, I am not blaming anybody; we were all as bad as one another probably. As for individuals, Hudson’s dash, “Whacker’s” tackling, Romans’ kicking, Woods’s all-round play, Johns’s dribbling, Stephens’s taking of passes, and Gordon Vears’s language in his capacity as leader, are abiding memories. The “full-throated ease” with which Gordon used to urge on his men was a joy to listen to; the words were very native English indeed! Well, gone are those days, except as abiding memories. We only go through that phase of life once. I was fortunate in having my lot cast with the Gloucester Club, and I hope that players and spectators alike enjoy the Club’s activities to-day as much as we did. Good luck to the old Club! TO ME, KINGSHOLM IS THE BEST CLUB GROUND IN THE COUNTRY; YES, AND IN THE WORLD! THERE IT WAS THAT I BEGAN MY PLAYING DAYS IN FIRST-CLASS FOOTBALL IN 1903. Stories of what great games had been played on “the Spa” I used to hear from dear old “Tommy” Bagwell and George Romans – both Rugby mentors of mine – and that keen enthusiast and honoured citizen, Alderman S. J. Gillett, still my close friend. But that was past history. The live Kingsholm ground was for seven years part of my being, and has ever since been the core of the memories of my active playing days, which have been revived at least once every year by visits to the grand old City. Again I say it – this is the ground, a fair nut for everybody with no idiosyncrasies to give the home side an advantage, that every real Rugby man the world over knows and which the many Gloucester men that I met in New Zealand asked after at once. Perhaps they would not all have felt quite the same affection for it now, with its added stands and other amenities, all so different from what it was in my days, with just one small homely stand; the dressing room for the players in the little inn opposite the entrance; the walk from the inn to the ground in our caps and blazers, and the little run about on the sacred turf before the kick off. I see all that now, as I do my fellow-players, drawn from every walk of life, and forming as happy a party as any club ever had, with George Romans, Arthur Hudson, Jimmy Stephens, Gordon Vears, Billy Johns, Ginger Wood, George Holford, Harry Berry, Whacker Smith, Willie and Ernie Hall, Bert Parham, Fred Pegler, “Shanter” Dix (my successor at half-back and a great little man), and Jimmy Whyburn among them. Nor must we forget their admirable chronicler, Bill Bailey, still happily with us. Dai Gent, the tiny giant of Gloucester Rugby, is dead. He died at Eastbourne, where he had been living for more than 40 years, yesterday, at the age of 81. One of the greatest scrum-halves who ever played for Gloucester, Donald Roger Gent had two trials for Wales, the land of his birth, before he was eventually selected to play for England in the 1905-6 season. He appeared against Ireland, Wales and the first ever All Blacks side in 1906 and against Ireland and Wales in 1910. In fact Mr. Gent was hoping to attend the dinner following Western Counties’ match against the present New Zealand touring team at Bristol last month, when he could have met his old friend and club-mate, Mr. Arthur Hudson. At the time Mr. Hudson, now the most distinguished Grand Old Man of Gloucester Rugby, was concerned about Mr. Gent’s health and was very disappointed that he could not meet the former scrum-half in company with the contemporary players. Mr. Hudson, associated with the Gloucester club for more than 50 years as player and secretary, played with Mr. Gent in the England 1906 sides against Ireland and Wales and altogether collected eight England caps. Talking about his life-long friend today, Mr. Hudson was loud in his praises of Mr. Gent as player, journalist and man. “I have Gent to thank for many of the tries I scored for Gloucester, Gloucestershire and England. His service from the scrum was the best any threequarter line could wish for. Mr. Gent came to Gloucester when he was studying at the Cheltenham Teachers’ TrainingCollege in 1903-4 season and captained the Gloucester RFC in 1907-8. He also led Gloucestershire to the County Championship in the 1909-10 season and later, when he became a headmaster at Saltash, played for Cornwall. Mr. Gent ended his teaching career as headmaster of Bedewell School, Eastbourne, where he was a member of the council and chairman of the hospital management committee. He retired from his post as chief Sunday Times Rugby football critic in 1955. Mr. Donald Roger Gent [a correction was later printed to say that this should have been David Robert Gent], who died yesterday in an Eastbourne hospital at the age of 81, will be remembered with admiration and affection by every section of the Rugby loving public, for after his playing days were over he added journalism to his own profession of schoolmaster. Small physically, only 5ft. 3in. in height, Dai Gent was a large man in most other ways. He learnt his Rugby in Wales, for which country he had a couple of trials, at a time when it was customary for the two half backs to alternate between their functions according to the side of the field in which the game found itself at any particular moment. He was born at Llandovery, in Carmarthenshire, and many people, from his name and lilting rather high pitched voice, assumed that he must have played for Wales; in fact he played for England, as a member of the Gloucester Club, five times in 1906 and 1910, in the former year appearing against the first All Blacks to tour this country. He captained Gloucestershire, and later appeared for Cornwall. He became headmaster of a large school in Eastbourne, in which town he retired. After the First World War he became Rugby football correspondent of the Sunday Times, from which appointment he retired in 1955. With his great knowledge of the game he was admirably suited to his job, and he was a kindly critic. He was never harsh, for he hated hurting anybody, yet his judgements always carried infinite respect. He was not only kind to players but also to a host of younger journalists who will remember his help and generosity of spirit with gratitude and affection from days when, with J. P. Jordan and O. L. Owen, he formed a triumvirate of great writers on the game. Dai played in the same side as my grandfather, Ernie Hall, and his brother Albert from 1904 to 1908. Then alongside their younger brother Billy Hall in 1909 and 1910. Dai and Ernie both played the All Blacks in 1905 and the game for the opening of the new gymnasium (Lions Den) at Kingholm that year.